My reply: “Well, I guess I don’t mind all his songs sounding the same… I really like the song!” Little did I know that this same phenomena would exist with wine. A few years ago I blogged about a wine from Talbott: (https://blog.musingsonthevine.com/2012/05/11/2009-talbott-sleepy-hollow-vineyard-pinot-noir-santa-lucia-highland-california/) and as a result of really liking the wine, picked up a case. 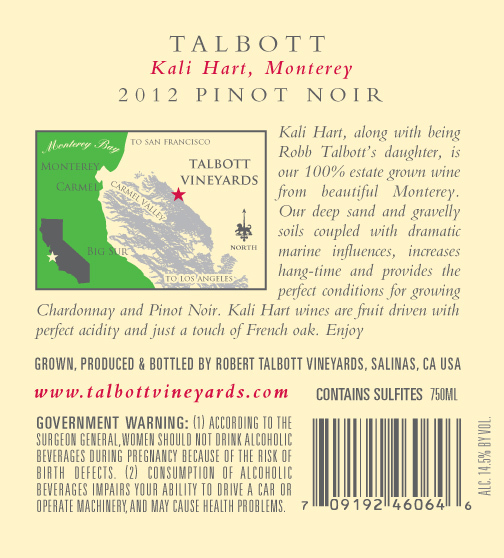 Fast forward to today and wouldn’t you know, I ran across another bottling from Talbott, their Kali Hart Pinot Noir from Monterey County and like my musical tastes, I just had to try it. 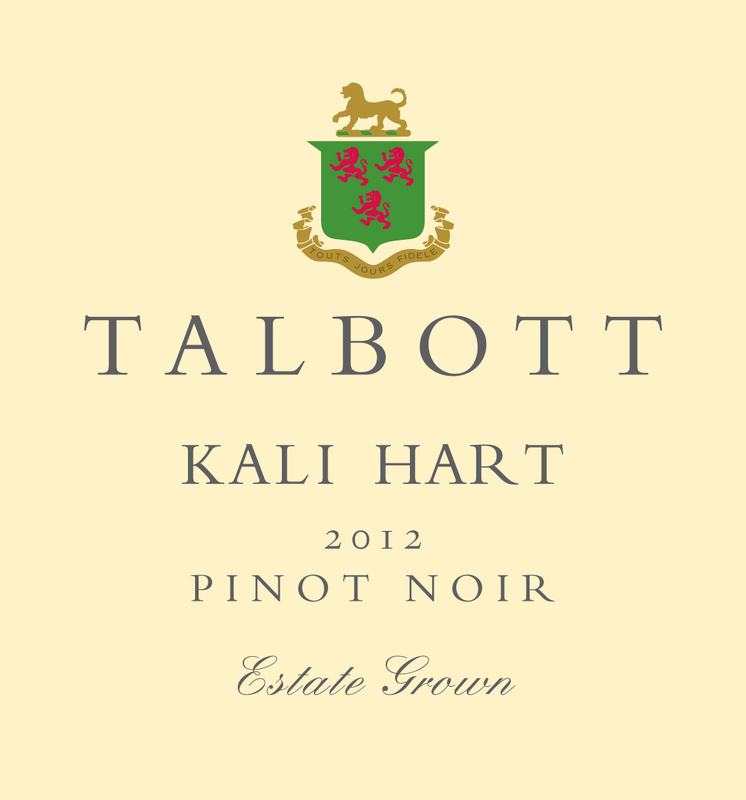 The Kali Hart Pinot Noir is an estate grown wine that is named for the youngest daughter of Robb Talbott, Kalin. In reading the technical details of the wine, we see that the grapes are sourced from the same vineyard, the Sleepy Hollow Vineyard, as the wine I reviewed back in 2012. The difference being that the Kali Hart is taken from younger, less mature vines, suggesting the wine is similar in character, but perhaps lacking the refinement and intensity that older vines can often impart. And, where we spent $24 NET per bottle for the Sleepy Hollow, the Kali Hart comes in at $17.99 BEFORE the discount, so it is conceivable to find the wine at less than $15 NET. I would say that given the similarity between these two wines, the potential $9 savings makes the Kali Hart a really good bargain. This reinforces the point – our wine cellar is loaded with verticals because when we find a producer we like, we tend to follow them from year to year and from wine to wine. Sure, some may say that this a bit myopic, but in fact, if you follow a producer long enough, like a great musician, you see how the wisdom of age subtly changes their style and interpretation through the years. Isn’t that what true appreciation is all about? Bright, fruity nose with lively red berry aromas and light floral hints. Medium-bodied with moderate acidity and supple tannin – well balanced. Fruity palate with raspberry, cherry and blackberry notes. Moderate length – smooth with a bit of earthy complexity on the finish. Drinking well now and should hold for another 2 to 3 years. Very Nice! Back in June I wrote about a rosé wine from Le Fraghe and noted that, based on the quality and appeal of the wine, I would be “seeking out other wines from Matilde Poggi.” Well, true to my word, I came across a red wine from Le Fraghe that I just had to try. 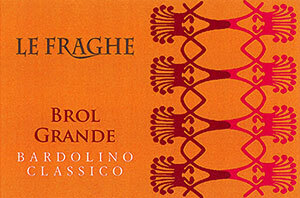 The Brol Grande is a single vineyard Bardolino Classico red from the commune of Affi. The wine is a blend of Corvina and Rondinella grapes from vines with an average age of 15 years. The vineyard is southern exposed at an elevation of approximately 600 feet. Each grape is vinified separately with maceration lasting about 7 to 8 days. The wine is pumped over daily and subject to complete malolactic fermentation. Upon completion, the wine is then placed in large 1,000 gallon wooden vats for 8 months of aging and further settling. The resulting wine is truly charming and seductive, emphasizing the fruity, spicy nature of both the Corvina and Rondinella grapes. While not built for long aging, the wine does possess elegance and structure with moderate levels of fruit. At an average pre-discount bottle price of $17.99, this wine is an excellent value! Bright, lively nose with fresh cherry, allspice and floral hints. Medium-bodied with firm acidity and supple tannin – well balanced. Slightly tart, red berry palate with juicy cherry and strawberry notes – seductive. Moderate length – smooth with a crisp finish – some nice layered complexity on the finish – mineral, black pepper and nutmeg. Drinking well now – should hold well for another 2 to 3 years. Good value. In a recent copy of Imbibe magazine I learned about a new line of pre-made cocktail mixers from an outfit called Bittermilk in Charleston, South Carolina. Like the author of the piece, I eschew most pre-made cocktail mixers, primarily because they are really bad and don’t make anything even close to the cocktail suggested on the bottle. I would rather pass on a cocktail, or struggle to find the right ingredients before using the usual dreck that constitutes pre-made cocktail mixers. After sampling them with my favorite spirits, I can justly say they are amazing. The Whiskey Sour is about the best I have ever had, bright, refreshing with near perfect balance. The Old Fashioned is lush with a lovely, nuanced vanilla character. The Tom Collins is light and floral with a crisp, bright finish. The other nice aspect to these compounds is that you basically pick your spirit, mix with the recommended proportion of compound, shake/stir/strain and you’re done. Nothing could be easier, nor more pleasing. The labor really is in the bottle. While I did not look for them locally, you can order them from the web site: www.bittermilk.com. They run $15 per compound, plus shipping – not inexpensive, but for the quality and the ease of use, they are certainly worth the price. Next, let’s talk of history. Regardless of its ancestry, Zinfandel found its way to America and was planted on the west coast during the middle of the 19th Century. The grape is a hardy vine and it thrived in the dry, hot regions of Central and Northern California. Ten percent of all vineyards in this part of California are said to contain plantings of Zinfandel vines and it was the most planted varietal in California as the 20th Century dawned. Production soared during the run up to Prohibition, but like most grapes at that time, Zinfandel suffered mightily at the hands of our noble experiment. It actually wasn’t until the early 1970’s, when Bob Trinchero of Sutter Home Winery began experimenting with Zinfandel, creating a light, blush version that was slightly sweet, that Zinfandel reappeared on the wine landscape. And as they say, the rest is history. Fortunately, the rebirth of Zinfandel did not damn it to a golden age of mediocrity. Plenty of winemakers realized the potential of the grape and began crafting red versions that underscored the intense fruit and spicy character of the varietal. One such producer is Rosenblum Cellars, founded in 1978 by Kent Rosenblum, the veritable “King of Zin,” located in Alameda, California. Rosenblum focuses solely on Zinfandel and actually, unlike many California wine makers, searches out small grape growers to source produce for their wines. They choose this approach, in lieu of practicing the “estate” model of cultivating their own vines, for several reasons: it provides a showcase for small, passionate producers from underappreciated regions; it underscores the differences between mountainside versus valley floor grown grapes; and it allows the nuance and power of many “old vine” vineyards to validate the credibility of Zinfandel as a world-class varietal. I featured the 2011 Rosenblum Contra Costa County in my Summer Sippers class this past June. It struck me as an ideal red wine for summer, possessing enough tannin to give it structure to stand up to hearty grill fair, but fruity enough to make it pleasant on a hot afternoon. The wine was also right-priced at around the pre-discount price of $14.99/bottle. Intense, jammy nose with black berry, dried fruit and exotic spice hints. Full-bodied with moderate acidity and moderate, firm tannin – well-balanced. Dark fruit core with loads of black cherry, black berry and tarry notes. Fruit forward but very nicely structured. Moderate length – smooth with many evolving layers of complexity – seductive and spicy – charming. Drinking well and should hold for another 2 – 3 years in bottle. Great value.